4292- Kosman drag wheel sprocket 630 chain. Our Products >> Custom build rear sprocket, Blanks, Race wheels. >> 4292- Drag Bike wheel sprocket - Kosman wheel. 630 chain. 4292- Drag Bike wheel sprocket - Kosman wheel. 630 chain. 4292- Drag bike wheel known as Kosman wheel. Center hole is 2.189 inch or 55.6 mm. Bolt circle is 3.00 inch or 76.2 mm and 8 bolt holes, size 0.316 inch or 8.0 mm. 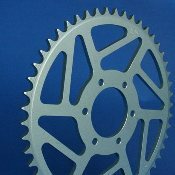 This is a 630 chain sprocket. Available in 30 through 56 tooth sizes. See part number 4272 for the same part in 530 chain size.